During your holidays in the Cévennes at Mas de la Cam campsite, you will have the opportunity to make beautiful hikes and other physical activities that will put your body to the test. How about a swim and a few breasts with the family to relax? Our outdoor hotel has a large outdoor pool of 500 m2, part of which is heated in low season. Even the most cautious holidaymakers can enjoy it during their stay. Swim your swim lengths, jump, dive. Perfect your backstroke, your butterfly or your zen attitude. Our pool is large enough for all our visitors, adults and children, to indulge in their own way. Toddlers will be delighted to have fun in the water games at the edge of the pool. As for you, discover all the benefits of idleness during your tanning session on the solarium! Although the water space is secure, your children stay under your supervision. 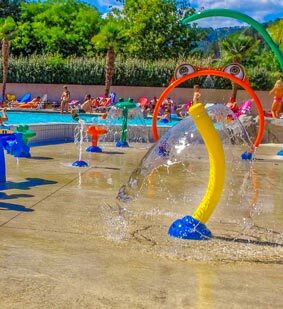 Join us at the Mas de la Cam campsite in the Gard, where you will have the holiday of a lifetime with vast grounds and swimming pool. Ranked as a 4* campsite, we offer high-quality services and facilities with an immense playground. Young and old enjoy splashing around in the swimming pool and aquatic playground. Enjoy swimming in our large outdoor 500m² pool, partially heated in low season. And we have just set up a new playground where all ages can have fun with lots activities in the water. While the children are playing on the Vortex games, the adults can laze in the sun on our sunloungers. At Mas de la Cam there are plenty of things to do if you like activities in the water during your holidays. Because, as well as the pool, the Gardon river flows by our campsite, for even more fun in the water. 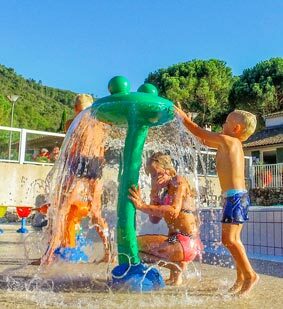 There will be something for all ages, and for all tastes at the campsite’s water park in the Languedoc Roussillon. Young and old will enjoy a relaxing moment at the edge of the pool or for a swim in the aquatic area of the campsite. The aquatic area caters to all ages and tastes. 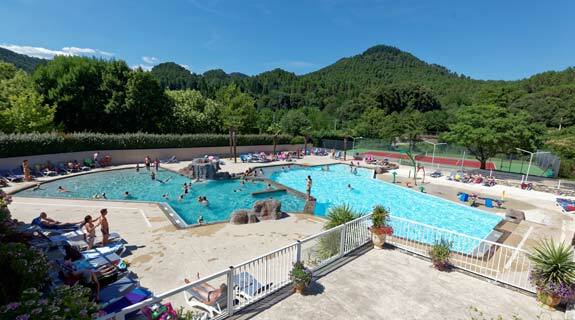 A fun space for swimming and playing throughout your holidays at this Cévennes campsite, in both high and low season. And there are many other aquatic activities in the Gardon river which flows by our campsite in the heart of the Cévennes, which also has pétanque and tennis courts.